My name is Tsigue Shiferaw. I was born in Bordeaux, France, although of Ethiopian descent. I initially started my professional career in education. From secondary school all the way to my Bachelor in Arts, I often looked after babies as well as work part-time as a school supervisor. This led me to the United Kingdom where I worked as a French Language Assistant (Billericay). This is where I completed a Post Graduate Course in Education where bilingualism was a major focus of the course, leading me to teach Modern Languages (French and Italian) to Middle School students for a couple of years. I was then able to try another passion of mine: radio, and completed a Master of Arts in Radio production in London, while working for the prestigious BBC World Service, exploring all aspects of this wonderful medium through theory and practice. This gave me the chance to live in Ethiopia for many years and work as a journalist there, covering many children related stories (autism, malnutrition, education to name a few). This is also where my three children were born. Ever since their birth, I focused on teaching them the language I know best: French and they are now bilingual. We all became residents in New York City in 2012. I first started to work at Petits Poussins Too as an afterschool teacher. 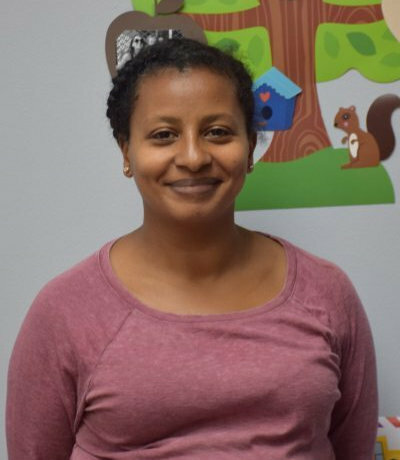 I am now very pleased to be working with young children again in the toddler room, in a bilingual environment and to be a part of the Bilingual Nest Team!